Generation of intratumoral phenotypic and genetic heterogeneity has been attributed to clonal evolution and cancer stem cells that together give rise to a tumor with complex ecosystems. Each ecosystem contains various tumor cell subpopulations and stromal entities, which, depending upon their composition, can influence survival, therapy responses, and global growth of the tumor. Despite recent advances in breast cancer management, the disease has not been completely eradicated as tumors recur despite initial response to treatment. In this review, using data from clinically relevant breast cancer models, we show that the fates of tumor stem cells/progenitor cells in the individual tumor ecosystems comprising a tumor are predetermined to follow a limited (unipotent) and/or unlimited (multipotent) path of differentiation which create conditions for active generation and maintenance of heterogeneity. The resultant dynamic systems respond differently to treatments, thus disrupting the delicate stability maintained in the heterogeneous tumor. This raises the question whether it is better then to preserve stability by preventing takeover by otherwise dormant ecosystems in the tumor following therapy. The ultimate strategy for personalized therapy would require serial assessments of the patient’s tumor for biomarker validation during the entire course of treatment that is combined with their three-dimensional mapping to the tumor architecture and landscape. Inter- and intratumoral heterogeneity refer to the genetic diversity between and within patient tumors, and genomic instability is regarded as a major driving force for tumor heterogeneity. Cancer cells are intrinsically genomically unstable which predisposes them to increased mutation rates resulting in evolution of tumor subpopulations with notably distinct phenotypes. The presence of distinct subpopulations of cells within a tumor with distinguishable differences in tumorigenicity, metastatic potentials, and therapy sensitivities was elegantly demonstrated several decades ago [1, 2, 3]. The relative abundance of the tumor subclones or subpopulations is dependent upon the selective pressures imposed by genetic-mediated and epigenetic-mediated (microenvironment) constraints that allow tumor subclones to take different routes that enable survival and acquisition of malignant properties. Interestingly, despite the fact that tumor evolution is proposed to follow the laws of Darwinian evolution whereby tumor subclones accumulate new genetic alterations that confer growth, survival, and metastatic advantages, it must be recognized that these evolutionary changes do not dramatically alter the major lesion morphologies or phenotypes within the tumor. Despite the genetic heterogeneity revealed by deep sequence analysis, breast tumors still preserve the major histotype architectures that pathologists use to classify them as hyperplastic, atypical hyperplasia, ductal carcinoma in situ (DCIS), lobular carcinoma in situ (LCIS), invasive carcinoma, etc., indicating a gap between genetic diversity and phenotypic stability. We propose that maintenance of phenotypic stability of the lesions despite their genetic variabilities is attributed to the presence of progenitor or precursor cells that carry defined sets of genes that preordain them to differentiate selectively into a specific histotype (e.g., atypia, any one of the many DCIS subtypes (comedo, cribriform, papillary, etc. ), invasive ductal, or lobular carcinoma). Two models have been proposed for generation of intratumoral heterogeneity—the clonal evolution and the cancer stem cell models—and studies show that these mechanisms are mutually inclusive . In the clonal evolution model, cells acquire mutations that not only give rise to derivatives with different functionalities and behavior but also serve as a platform for further acquisition of genetic alterations. In the continuum of evolution, this process produces tumors with noticeably distinct and variant abilities for survival, malignancy, and therapy tolerance at the regional and distant metastatic sites. This model predicts that cancers arise from a single cell , which over time can develop various combinations of mutations resulting in genetic drift and selection of the fittest [6, 7, 8]. According to the clonal evolution model, cancer progression is non-linear with clones branching out to produce diverse clones, which leads to heterogeneity [4, 9]. One of the disadvantages of this model is that it ignores non-genetic variability and does not take into consideration the interactions among clones within the tumor ecosystem . In contrast, the cancer stem cell (CSC) model proposes that only a small subpopulation of tumor cells with stem cell properties drives tumor initiation, progression, and recurrence because of their indefinite self-renewal capability [4, 5, 11], and eradication of this subpopulation is critical for tumor elimination. CSCs share fundamental properties of stem cells, but harbor tumor-initiating mutations which can be transferred to the progeny , and are recently referred as tumor-initiating cells (TICs). Two theories have been proposed to explain the origin of CSC: they can arise through mutations in normal stem cells or through the acquisition of mutations in progenitor cells . Heterogeneity in CSCs has been revealed by generation of a variety of differentiation states . As discussed below, our studies suggest that distinct genetic alterations define CSC/TIC subsets which confer them with the ability to generate either unipotent (single phenotype) or multipotent (multiple phenotypes) derivatives (Fig. 1). Recent evidence shows that both of these models are mutually inclusive . This is further amended by the recent hypothesis that differentiation of stem cells is not a unidirectional process as the plasticity of the cells can allow dedifferentiation of the differentiated cells into cells with stem-like properties [15, 16, 17]. Regardless of the mechanisms by which intratumoral heterogeneity is generated, the tumor ecosystem consists of variant cell populations that coexist and potentially influence each other’s behavior and survival. The MCF10AT xenograft model is a model of early human breast cancer as it faithfully recapitulates the key histogenetic pathways of premalignant breast cancer , and thus provides a unique model for studying human breast cancer heterogeneity. MCF10A cells from which MCF10AT cells were derived were established by spontaneous immortalization from benign fibrocystic breast disease . MCF10A cells are non-transformed human breast epithelial cells with a stable pseudodiploid karyotype and possess normal stem cell properties. When orthotopically implanted, they produce normal ducts comprised of luminal and myoepithelial cells with a short life span. Stable transfection of MCF10A cells with mutant Ha-ras preserved the multipotent stem cell property of MCF10A cells as MCF10AT xenografts produce ductular structures with the myoepithelium properly oriented between a basement membrane and the luminal epithelium. When orthotopically implanted, MCF10AT xenografts produce lesions containing variable amounts of simple ducts, hyperplasia, atypia, DCIS, and frank carcinoma . In vivo implantation of single clones of MCF10AT cells showed that all clones produce simple and hyperplastic ducts surrounded by the myoepithelium, confirming that these ducts originate from stem cells/progenitor cells rather than from distinct populations of cells that give rise to either myoepithelial or luminal subtypes. 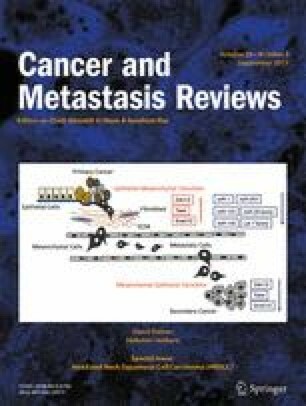 MCF10AT cells express functional estrogen receptor α (ER α) and respond in vivo to exogenous estrogen supplementation with increased frequency of index precursor lesions atypia and DCIS but with minimal impact on the frequency of invasive carcinomas [20, 21]. While treatment with tamoxifen abolishes atypia and DCIS, tamoxifen treatment had no impact on invasive carcinoma despite being ER+ . According to the clonal evolution model, a tumor cell gains malignant potential by acquiring new genetic alterations and resultant clonal expansion. This would require the presence of index precursor lesions for the development of invasive carcinomas. However, since tamoxifen-treated MCF10AT xenografts showed the presence of invasive carcinomas at a similar frequency as those exposed to estrogen despite the absence of atypia and DCIS , these data suggest that precursor (atypia and DCIS) and malignant (invasive carcinoma) components of a tumor can arise independently from a transformed stem cell/progenitor cell/TIC) and that the proportion and frequency of specific histologic subtypes in a tumor would depend upon initiating alterations defining the CSC or TIC subset and their subsequent ability for clonal expansion. It is conceivable that hormonal therapies and other therapeutic agents could similarly exert specific effects upon the renewal and differentiation of CSCs/TICs/progenitor cells and hence control the subsequent histogenic pathways of tumorigenesis and therapy sensitivity. Our data also reveal a mechanism for emergence of drug resistance. The current thinking attributes drug resistance to the presence of a CSC subpopulation that is elusive to therapy, and their elimination is critical for complete therapy response. However, our data suggest that, similar to the precursor lesions, malignant lesions can also arise from CSCs/progenitor cells, albeit from a distinct CSC subset. Breast CSCs were first identified as a CD44+/CD24−/low population that has the enhanced ability to initiate tumor growth when xenografted into immunocompromised mice . CD44/CD24 expression analysis of MCF10AT xenografts showed CD24−/low and strong CD44 immunoreactivity in regions of DCIS and invasive carcinoma, and whereas CD44-expressing DCIS lesions were eliminated by tamoxifen therapy, tamoxifen had little impact on CD44+/ER+ invasive cancer cells. These data suggest that retention of CD44+ cells in the residual tumor is not responsible for the failure to achieve complete therapy response . These data are consistent with a study by Liu et al. who demonstrated that commonly used putative CSC markers CD24, CD44, ALDH, and SOX2 are not coexpressed in the same cells. The authors were unable to identify specific CSC subpopulations using these markers and found that the relative expression levels of these markers did not correlate with each other or with therapy resistance . Further support for our hypothesis was provided by Miller et al. who by single cell cloning of MCF10AT cells isolated MCF10DCIS.com cells, so named because of their ability to differentiate in vivo directly into pure DCIS lesions without going through lower grades of ductal differentiation. These data provide further support for the presence of distinct subsets of transformed stem cells/progenitor cells carrying specific genetic alterations that predetermine their differentiated progeny. Over a period of time, the DCIS lesions progress to invasive carcinoma, potentially by clonal evolution and expansion. Similarly, Miller et al. have also isolated from MCF10AT xenografts MCF10CA1A and MCF10CA1D cells that progress directly to invasive carcinomas, providing additional support for this hypothesis . These data suggest that differences in the rates of differentiation of different CSC/progenitor cell subpopulations influence the composition and relative amounts of the phenotypically distinguishable progeny histotypes or the heterogeneity that is characteristic of breast cancers. This raises an important question of whether, despite phenotypic resemblances, the invasive cancer cells derived from CSC subsets are genetically similar to the invasive carcinomas arising by clonal evolution of DCIS. Depending on whether they represent related or distinct entities, this could significantly impact clinical responses of the tumors. Compounding these effects, differentiated mammary epithelial cells have been reported to undergo reprogramming to multipotent mammary stem cells by forced expression of stem cell transcription factors  illustrating the phenotypic plasticity of mammary cancer cells. Our findings support the emergence of precursor or malignant lesions from separate putative CSCs/progenitor cells, which could either have restricted potential for differentiation (unipotent lineage) or have the ability to give rise to multiple lineages (multipotent). Molecular analysis of comedo-DCIS derived from MCF10DCIS.com cells showed that the majority of the comedo-DCIS is Her2/neu negative with the basal marker p63/cytokeratin 5-expressing cells restricted to the myoepithelial layer. However, interestingly, the tumors also contain small areas of comedo-DCIS that coexpress basal (p63) and luminal (Her2/neu) markers . Progression of comedo-DCIS in these tumors results in invasive carcinomas that are p63+/Her2− as well as p63+/Her2+. Clinical comedo-DCIS similarly shows the presence of p63/Her2-colabeled and p63+/Her2− cells, providing clinical support for the MCF10DCIS.com data and validating a novel link between comedo-DCIS and basal-like breast cancer . Several studies have reported that a subset of in situ ductal carcinomas as defined by genomic [30, 31] or immunohistochemical [32, 33, 34, 35, 36] definitions is basal. In most cases, basal DCIS was associated with high nuclear grade, central necrosis (resembling comedo DCIS.com lesions), and high proliferative indices . Basal DCIS was often found to be admixed with invasive basal breast cancers, suggesting that basal DCIS could serve as precursor lesions for invasive cancers ; however, interestingly, earlier precursor lesions such as atypical ductal hyperplasia for basal DCIS have not been identified . The emergence of DCIS with distinct molecular subtypes (Her2+ and Her2−) from MCF10DCIS.com clone suggests the presence of multipotent CSCs/progenitor cells and that their differentiation rates may ultimately determine the relative amounts of Her2/neu-expressing or Her2/neu-non-expressing DCIS and their subsequent invasive potential. Based on our data that p63 and Her2/neu are coexpressed in clinical comedo-DCIS and the MCF10DCIS.com comedo-DCIS models, we posit that the p63 and Her2/neu expressors share a common precursor and that the p63+/Her2+ cells represent an intermediate progeny of stem cell differentiation. Since the p63+/Her2+-coexpressing cells are detected both in the myoepithelial and luminal compartments of comedo-DCIS, we suggest that these transitional precursors probably experience a block in differentiation into discrete p63+/Her2/neu− (basal cells of myoepithelial lineage) and Her2+/p63− (Her2-overexpressing) lineages. It is conceivable that p63+/Her2+ coexpression could potentially direct novel or modified gene expression programs and, depending upon their relative amounts in the tumor, they could potentially alter their growth potentials and therapy sensitivities. Thus, while patients with p63/Her2-coexpressing DCIS may benefit from Her2-targeted therapy, this opens up the clinical dilemma whether targeting Her2/neu would allow for expansion of p63+/Her2− progeny and consequently promote transition to typical basal-like breast cancer. Molecular profiling studies have revealed that heterogeneity is limited not only to cancer cells but also to components of the tumor microenvironment. The rate and frequency of occurrence of a specific or general pathway(s) of differentiation are determined not only by genetic features intrinsic to tumor subpopulations but also by extraneous elements such as dietary factors, environmental agents, therapy, or diagnosis-induced stress (e.g., biopsy collection) on the tumor cells and the stromal microenvironment. Genetic- and microenvironment-mediated epigenetic events can trigger activation and/or prevent the return to quiescence of activated stem cells/progenitor cells, thus trapping the activated cells in a state of continuous renewal. The importance of growth regulatory role of breast stroma in normal development and cancer is well documented [38, 39, 40, 41, 42, 43, 44]. Studies from our laboratory using three-dimensional cocultures of non-transformed or premalignant human breast epithelial cells with normal or tumor-derived fibroblasts and/or endothelial cells have revealed distinct functional roles for these stromal elements in reconstitution of an ecosystem that is more favorable towards either a benign or transformed phenotype . When placed in a microenvironment containing normal breast fibroblasts, the growth and aberrant ductal branching morphogenesis of both non-transformed and transformed breast epithelial cells are inhibited. However, growth and aberrant ductal branching morphogenesis of both normal and transformed breast cells are stimulated by a tumor-derived fibroblast microenvironment. Interestingly, the growth inhibitory effects of normal fibroblasts are not relieved by the addition of endothelial cells to the microenvironment, whereas endothelial cells augment the growth stimulatory effects of tumor-derived fibroblasts [45, 46]. These data not only reveal the dominant epigenetic regulatory roles of the stromal microenvironment in the activation or maintenance of quiescence of progenitor cells but also demonstrate that stroma-mediated epigenetic forces not only override the genetic constraints of breast epithelial cells but also take advantage of tumor cell plasticity. Histologic analysis of breast tumors provides evidence for the reciprocal/symbiotic relationships between the epithelium and its stromal microenvironment. Consistent with the varying proportions of precursor index and malignant lesions in a tumor, the composition and proportions of the stroma surrounding individual lesions are also variable, suggesting a reciprocal and active relationship between the epithelial cells and the stroma (Fig. 2). The assembly of a rich stromal microenvironment comprising of fibroblasts, endothelial cells, immune cells, and/or inflammatory cells would not only provide a rich soil and matrix for renewal, differentiation, and clonal expansion and evolution of CSCs/progenitor cells that are marked for a particular histotype but would also provide a barrier or shield against attack by therapy or immune surveillance. Broad-range chemotherapeutic regimens utilize the maximum tolerated dose to eradicate tumors by inducing lethal toxicity to the bulk of the tumor cells. However, these regimens induce systemic toxicity. More recently, combination-targeted therapies have been implemented in clinical practice to overcome systemic toxicity and to simultaneously target multiple cell subpopulations within the tumor ecosystem to eliminate tumor burden. Targeted therapies represent a class of agents that has been designed to interact with specific molecules involved in cancer development and progression [47, 48, 49, 50, 51]. Current FDA-approved targeted therapies in breast cancer include Her2-targeted therapies (trastuzumab, pertuzumab, everolimus, lapatinib, and ado-trastuzumab emtansine), estrogen modulators (tamoxifen, toremifene, fulvestrant, anastrozole, exemestane, and letrozole), and cyclin-dependent kinase (CDK) inhibitors (palbociclib) [52, 53, 54, 55, 56]. Combination therapy utilizes these targeted therapies in conjugation with broad-range chemotherapeutic agents and/or other targeted therapies. Using combination therapy, clinicians can target the same molecular target (i.e., the use of trastuzumab and pertuzumab to target Her2), compensatory molecular pathways (i.e., the use of platinum-based compounds and PARP1 inhibitors to target DNA damage response pathways), or multiple nodes within a single pathway (i.e., using lapatinib to target both EGFR and Her2) [57, 58, 59], and clinical trials have shown improved efficacy and/or drug resistance reversal with combination therapy [53, 57, 59, 60, 61, 62, 63]. Indeed, the results of the phase III PALOMA-3 Trial examining ER-positive, Her2-negative patients with drug resistance found that combination therapy with palbociclib and fulvestrant resulted in significant improvement in progression-free survival (9.5 versus 4.6 months) compared to the fulvestrant alone arm . Additionally, it was found from the CLEOPATRA Study using patients with Her2+ metastatic breast cancer that the addition of pertuzumab to trastuzumab and docetaxel significantly increased progression-free survival from 40.8 to 56.5 months when compared with placebo, trastuzumab, and docetaxel , further showing evidence for the use of combination therapy to enhance drug efficacy. While these chemotherapeutic regimens have been found to enhance drug efficacy and revert drug resistance, new resistance develops [4, 64, 65, 66, 67, 68, 69, 70]. Emergence of therapy resistance has been attributed to the failure of eliminating drug-resistant CSC subpopulations and the resulting therapy-induced alterations in the tumor ecosystem [71, 72, 73]. Accordingly, while therapy-sensitive clones are eliminated, systemic therapies could alter the tumor composition by providing a mutagenic stimulus that promotes selection of resistant clones and consequent alteration of the proportions of tumor histotypes [74, 75; Fig. 3]. Since therapies target the most vulnerable lesion phenotypes in the tumor ecosystem, questions to consider include (i) whether the susceptible cells are required for maintaining a stable ecosystem that suppresses the outgrowth of resistant cells and (ii) whether the disruption of the tumor ecosystem enables reconstitution of a more homogeneous yet resistant tumor. Using a mixture of two sister subclones 168FAR and 4T07 derived from a single mouse mammary tumor and with varying metastatic propensities, Miller et al. injected orthotopically different mixture ratios of the cells into mice . The relative proportions of the two sublines in the tumors were analyzed by colony-forming assays using a medium selective for 168FAR or 4T07 cells. Regardless of the initial injection ratios of the two sublines, the resulting tumor primarily consisted of 4T07 cells . Additionally, the growth inhibition elicited by 4T07 cells was seen in monolayer cocultures, which was diminished when 4T07 cells were subjected to lethal irradiation prior to mixing with 168FAR cells. These data highlight the impact of tumor variants on the survival and growth potentials of tumor subpopulations in a tumor ecosystem. Crespi et al. recently described the tumor ecosystem to exist in a state of dynamic equilibrium between tumor cells that function as either cheaters or helpers, wherein the helpers provide the nurturing factors which the cheaters usurp to gain selective growth and survival advantages . Utilizing a human Rad6B promoter-driven ZsGreen reporter construct, Gerard et al. isolated Rad6B-overexpressing and Rad6B-underexpressing subpopulations of MDA-MB-231 breast cancer cells. Rad6B is a ubiquitinating enzyme that upregulates stability and oncogenic transcriptional activity of β-catenin [78, 79]. Although the Rad6B-overexpressing subpopulations produced smaller tumors compared to the control polyclonal parental cells, the tumors produced by Rad6B-overexpressing subpopulations were composed exclusively of cancer cells with a homogeneous EMT phenotype consistent with activated Wnt/β-catenin signaling and displayed high propensity for lymph node and lung metastasis whereas the loss of Rad6B impaired their tumor growth potential . These data suggest that while Rad6B is required for tumor growth and aggressiveness, the presence of low Rad6B-expressing subpopulation is necessary for the development of large tumors as seen with the control polyclonal parental cells . Similarly, coculturing parental MDA-MB-468 triple-negative breast cancer cells with MDA-MB-468 clones engineered to overexpress IL-11 enhanced the tumor growth of MDA-MB-468 parental cells, while the loss of the IL-11 subclone reduced the tumor growth of polyclonal parental cells . The addition of IL-11 and FGF-overexpressing subclones was needed to recapitulate the metastatic phenotype of the polyclonal parental tumor . These results indicate that it is the interaction between tumor subclones that creates cancerous phenotypes. These data lend support to the idea that the cells within the tumor ecosystem depend upon their biochemical interactions with the neighboring subpopulations for survival and expansion. However, these tumor cells can also exert inhibitory effects that prevent outgrowth of more resistant and aggressive subclones. Thus, chemotherapy aimed to disrupt this tumor ecosystem and induce apoptosis in responsive cells may ultimately eliminate this inherent inhibition, resulting in resistant disease. Changes in tumor heterogeneity following neoadjuvant chemotherapy at mid- and post-treatment phases were assessed by T2-weighted MRI changes in entropy (a measure of heterogeneity) and uniformity (a measure of homogeneity) by MRI. Reduction in entropy with an increase in uniformity was found to correlate better at mid-treatment than after completion of therapy . While this study suggests that treatment response may correlate with breast tumor homogeneity, since the analysis was limited to the maximum axial diameter, it may not be representative of the entire heterogeneous tumor and scoring systems incorporating degrees of partial response may be required to validate this observation. Intratumoral heterogeneity has been viewed as a clinical challenge to be combated. Although the obvious treatment option for breast cancer is surgical removal of the tumor, therapeutic options such as chemotherapy and radiation therapy are also followed in cases where surgery is not the first line of treatment. The end goal of therapeutic regimens is to induce apoptosis in the bulk of the tumor and eradicate/shrink the tumor. The advent of therapies targeted to critical molecules required for tumor growth has improved drug efficacy and clinical response. While combining targeted therapies with a broad range of chemotherapeutics and/or other targeted therapies aimed to disrupt multiple oncogenic pathways has shown clinical benefits, the development of drug resistance is inevitable in most cases. We posit that the elimination of certain vulnerable tumor subpopulations could disrupt an otherwise stable or dormant tumor ecosystem and inadvertently create new opportunities for the activation and outgrowth of quiescent therapy-resistant or aggressive histotypes by generating permissive microenvironmental conditions. The goal so far has been to reduce tumor heterogeneity so that the resulting tumor can be rendered more suitable for elimination by therapy. In this era of personalized medicine, much effort is focused on taking advantage of single cell-based deep sequence analysis and robust bioinformatic approaches to identify genetic alterations that define intratumoral heterogeneity or have predictive biomarker power. Single cell-based sequence analysis elegantly reveals genetic diversity; however, the success of treatment strategies based on outcomes of such analyses will be complicated by the dynamic nature of cell-cell, cell-stromal, and cell-matrix interactions and the ensuing heterogeneity within the complex tumor architecture. As the predictive value of biomarkers is confounded and compromised by intratumoral heterogeneity, identification of biomarkers with strong predictive power and accuracy will require simultaneous tracking of intratumoral heterogeneity during the course of clinical management. Heterogeneity trials such as the Breast Cancer Proteomics and Molecular Heterogeneity trial NCT01840293 is focused on analyzing the associations between proteomic/molecular heterogeneity and the characteristics of primary and recurrent/metastatic breast tumors. Elimination of vulnerable cell populations while reducing heterogeneity could revive otherwise dormant or minor subpopulations that restore heterogeneity and transform the tumor into a more resistant and aggressive type. This raises the question if it would be better to maintain stable disease or preserve heterogeneity by not disturbing the tumor ecosystem (preserving homeostasis). The ultimate strategy for personalized therapy would require sequential assessments of the patient’s tumor for identified/predicted vulnerabilities or intended targets during the entire course of treatment combined with their three-dimensional mapping of the tumor architecture and landscape. Work related to the analysis of histologic origins and stromal contributions to therapy response was funded by grants DAMD-17-02-1-0618 and W81XWH-09-1-0608 from the Department of Defense. BH was supported by T32-CA009531 and a fellowship from the DeRoy Testamentary Foundation. Rhiannon, F., & Richard, C. (2012). The complex nature of breast cancer stem-like cells: heterogeneity and plasticity. Journal of Stem Cells Research and Therapy. doi: 10.4172/2157-7633.S7-009. Rier, H. N., Levin, M. D., van Rosmalen, J., Bos, M., Drooger, J. C., de Jong, P., Portielje, J.E.A., Elsten, E.M.P., Ten Tije, A.J., Sleijfer, S., & Jager, A. (2017). First-line palliative HER2-targeted therapy in HER2-positive metastatic breast cancer is less effective after previous adjuvant trastuzumab-based therapy. Oncologist. doi: 10.1634/the oncologist.2016-0448. Dickler, M. N., Tolaney, S., Rugo, H. S., Cortes, J., Dieras, V., Patt, D. A., Wildiers, H., Hudis, C. A., O, Shaughnessy, J. A., Zamora, E., Yardley, D., Frenzel, M., Koustenis, A. G., & Baselga, J. (2017). MONARCH 1, a phase 2 study of abemaciclib, a CDK4 and CDK6 inhibitor, as a single agent, in patients with refractory HR+/HER2− metastatic breast cancer. Clinical Cancer Research. doi: 10.1158/1078-0432.CCR-17-0754 Epub ahead of print.